Dr. Smock is an associate professor of pathology and associate program director of the Pathology Residency Program at the University of Utah School of Medicine. She completed her medical degree, residency, and fellowship training at the University of Utah and is board certified in anatomic and clinical pathology, as well as hematopathology. In addition to serving as medical director of the Hemostasis/Thrombosis Laboratory at ARUP, she is an active member of several professional organizations and national committees in this area. 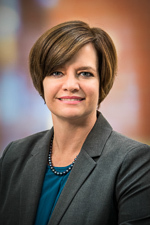 She is currently vice president of the North American Specialized Coagulation Laboratory Association (NASCOLA) and a member of the College of American Pathologists Coagulation Resource Committee and the National Comprehensive Cancer Network Clinical Practice Guidelines Panel for Cancer-Associated Venous Thromboembolic Disease. She is also an editorial board member for Research and Practice in Thrombosis and Haemostasis. Dr. Smock’s primary research interest is laboratory coagulation medicine.